For effective team communication, we have integrated Slack into Zoho Projects. Now, you can push your project updates to Slack feeds and manage your project activities. Group your project activities and conversations together to keep the project management process hassle-free. The Slack Integration is available for all the Zoho service plans. Click to learn more about access privileges for other app integrations. Integrating Slack into your Zoho Projects account opens up a menagerie of benefits for you and your team. From keeping your communications neatly organized, to finely crafted email filters, the Slack integration for Zoho Projects will keep your project on track from start to finish. Select in the upper-right corner. Choose the Other Apps menu from Integration. Click Add to Slack from the Slack Integration section to authorize. To authorize your portal to the Slack team. Select Zoho Projects from App Directory in Slack. Click Visit site to install to enter the Zoho Projects Integration page. Select the Portal and click Add to slack to add your portal to Slack. Click Authorize to successfully integrate Slack with Zoho Projects. After authorization, only portal owners will be redirected to Other Apps on the Integration page for further configuration. All others will be redirected to the Slack website. To push project updates to Slack channels. Click Add New and then select Slack Configuration. Select a channel from the PosttoChannel drop down to map the selected project to the specified slack channel. Turn it on to push the required project feeds to the Slack channel. In the Slack Configuration page, enable the feeds to be notified in the Slack channel. Select View List to see which projects are already configured. 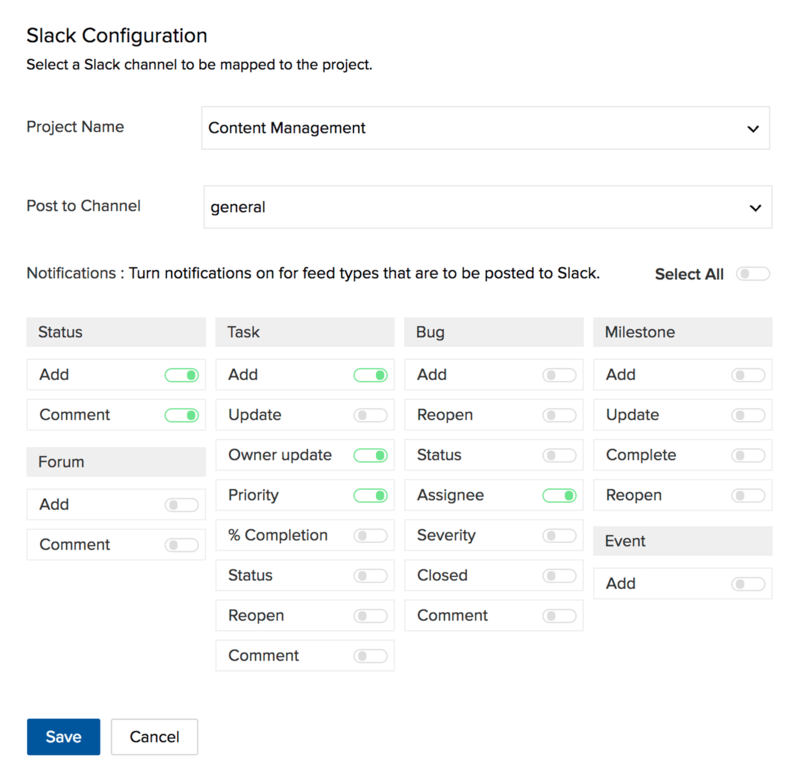 If a project is already configured to Slack, but the user wants to turn off update notifications, they can enable or disable the required project configuration from here. Click if you want to delete the configuration. Use slash commands and add your project entities from Slack to Zoho Projects. Type in "/zprojects -h" to fetch the list of Slash commands. Type in "/zprojects -l" to fetch the list of projects in your portal. Type in "/zprojects +" to access the add command. Users can either mention the project name or project ID next to the entities. Say, if you want to add a new task, bug, and status in a project titled Marketing, use the following slash commands in Slack. /zprojects +b UI issue ~Marketing. You can also use the project ID for adding task, bug, and status. When the access is revoked, an error message to reauthorize the Slack account is displayed. Click Add to Slack on the Integration page to reconfigure your Slack account. When the user wants to change their team, they can revoke and choose another team. Choose in the upper-right corner. Select the Other Apps menu from the Integration. Choose the Revoke link in the Slack section. Click Add to Slack and choose your team.